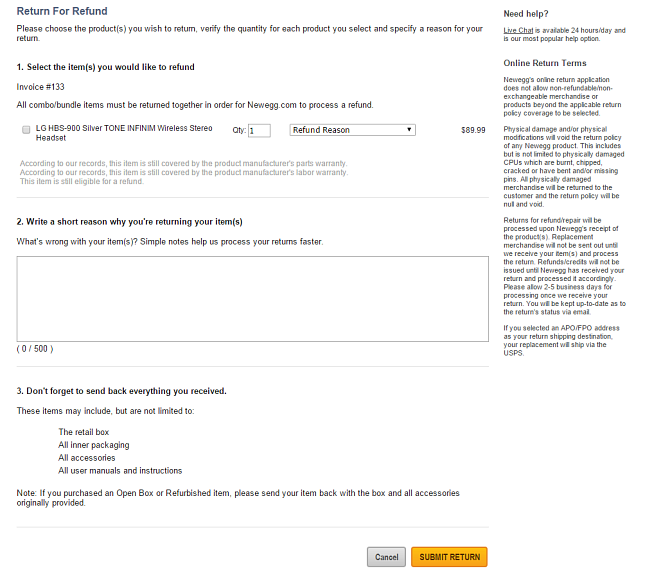 This tutorial will guide you through the process of how to return a Newegg item on Newegg.com. First, you may request an RMA number online by scrolling to the bottom of the website and selecting the Return an Item option beneath the Customer Service header. If you have a Newegg account, you can log in to your account. If you placed your order using a guest account or received an item as a gift, please enter your order number and either the purchaser’s email address or the shipping zip code into the available fields. Next, click the checkbox beside the items you want to return, and specify the returning quantity. Select the return reason, and write a detailed description of the issue in the space provided below. Your detailed notes will help our returns department process your return. Also, please note some returns may be subject to a restocking fee. If the option is available, you may select a different shipping address from your address book. Click the Submit Return Request button to complete the request. You will receive a confirmation email with the return details and instructions. You have the option of purchasing a return shipping label at a discounted rate by clicking the Create Return Label button. Next, click the “Calculate” button to calculate the cost of the shipping label. If you are a Newegg Premier member, the shipping label will be free. Next, enter your shipping address and your credit card information. Then click Continue. You will receive the return shipping label by email within 24 hours or sooner. Send the return to Newegg within 7 days or the return shipping label may cancel. If the label you purchased is cancelled, you will automatically receive a full refund. Once your return is received, it will be processed within 2-5 business days. Notebooks, tablets and desktop PCs require a 7-10 business day processing time. You will receive an email notification when your return is received and when it is processed by the returns department.